Keep papers secure and in order, even when folders are handled by lots of people and transported out of the office. Patented SafeSHIELD coated technology reduces paper tears, finger cuts and excessive fastener crinkling. Made of heavy weight 25 point pressboard stock for superior durability. Tyvek gusset expands up to 2" for greater storage capacity. Subdivide documents with ease. Two 2" prong SafeSHIELD coated B style fasteners in positions no.1 and no. 3. 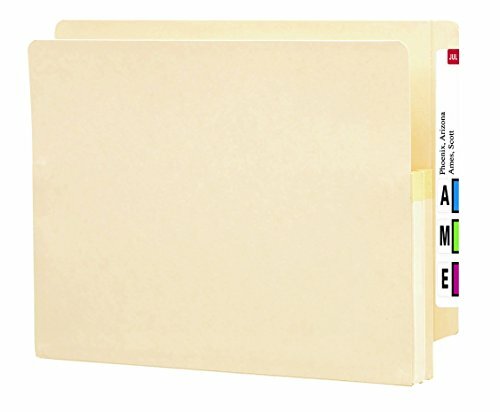 Includes 25 letter size folders (12-1/4" W x 9-1/2" H). 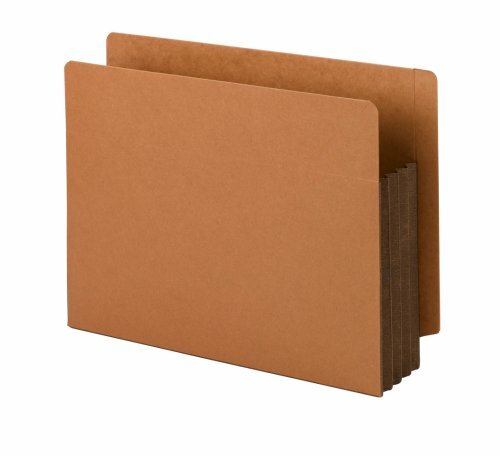 Each folder has a straight-cut tab. Proudly made in the USA. Contains 60% recycled content, 30% post-consumer material and is SFI Sourcing Certified. A Rich Heritage of Innovation and Quality. A world-leading provider of solutions for efficient document management, Smead is a woman-owned company well-known for its high quality, environmentally responsible products and innovative organizational systems. For more than a century, Smead has been committed to one purpose: Keeping You Organized! 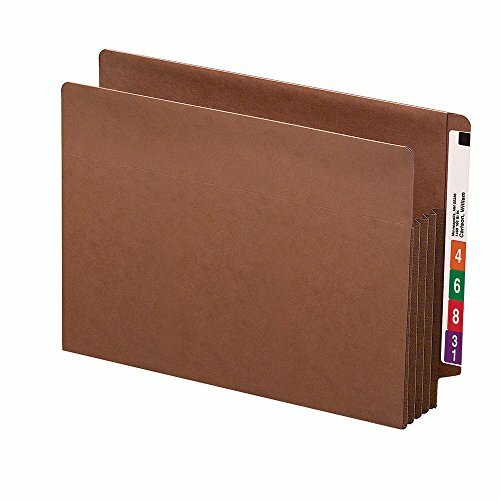 Smead End Tab File Pockets are favored by law firms and other document intensive industries. Pockets will hold standard letter size top tab folders without bulging. Accordion style sides expand 3-1/2" and hold up to 400 sheets. File pockets take up minimal space, expanding only when extra storage capacity is needed. Entire gusset is reinforced with tear resistant material for extra strength and durability. 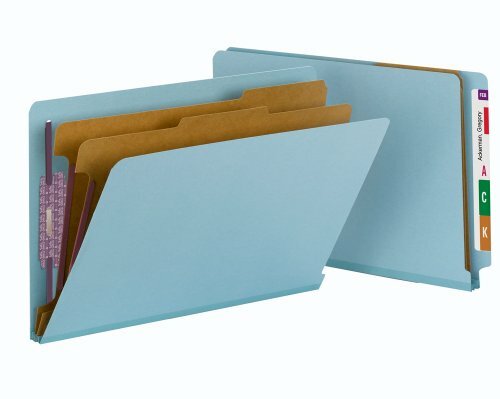 Colored gussets help organize files by case or subject. 3/4" wide straight-cut tab is reinforced for frequently handled files. Includes 10 extra wide letter size (12-3/4" W x 9-1/2" H) end tab file pockets with 3-1/2" expansion. Contains 30% recycled content, 30% post-consumer material and is SFI Sourcing Certified. A Rich Heritage of Innovation and Quality. A world-leading provider of solutions for efficient document management, Smead is a woman-owned company well-known for its high quality, environmentally responsible products and innovative organizational systems. For more than a century, Smead has been committed to one purpose: Keeping You Organized! Create a file within a file. Dividers with tabs and fasteners on both sides let you store information under several subdivisions, and fasteners on the front and back panels add additional filing surfaces. Protect your documents and fingers with Smead's patented SafeSHIELD Coated Fastener Technology the ultimate solution to fastener issues, including paper tears, finger cuts and excessive fastener crinkling. Heavy duty pressboard stock and Tyvek gusset. Expands up to 2 inches for greater storage capacity. Fasteners on front and back panels and dividers create 6 separate filing surfaces. 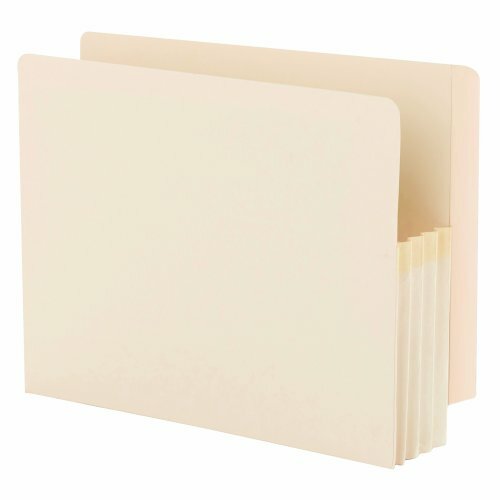 Includes 10 legal size classification folders (15-1/4"W x 9-1/2"H). Each folder has a 2/5 cut tab in center right position, SafeSHIELD fasteners and 2 dividers. A Rich Heritage of Innovation and Quality. A world-leading provider of solutions for efficient document management, Smead is a woman-owned company well-known for its high quality, environmentally responsible products and innovative organizational systems. For more than a century, Smead has been committed to one purpose: Keep You Organized! Keep papers secure and in order, even when folders are handled by lots of people and transported out of the office. Patented SafeSHIELD coated technology reduces paper tears, finger cuts and excessive fastener crinkling. Made of heavy weight 25 point pressboard stock for superior durability. Tyvek gusset expands up to 2" for greater storage capacity. Subdivide documents with ease. Two 2" prong SafeSHIELD coated B style fasteners in positions no.1 and no. 3. Includes 25 legal size folders (15-1/4" W x 9-1/2" H). Each folder has a straight-cut tab. Proudly made in the USA. Contains 60% recycled content, 30% post-consumer material and is SFI Sourcing Certified. A Rich Heritage of Innovation and Quality. A world-leading provider of solutions for efficient document management, Smead is a woman-owned company well-known for its high quality, environmentally responsible products and innovative organizational systems. For more than a century, Smead has been committed to one purpose: Keeping You Organized! Economical manila Smead file pockets keep large amounts of paperwork neatly contained and secure. Pockets will hold standard top tab folders without bulging. Accordion style sides expand 1-3/4" and hold up to 200 sheets. File pockets take up minimal space, expanding only when extra storage capacity is needed. Top of the gusset is reinforced with tear resistant material for extra strength and durability. 3/4" wide straight-cut tab is reinforced for frequently handled files. Includes 25 letter size (12-3/8" W x 9-1/2" H) end tab file pockets with 1-3/4" expansion. Contains 10% recycled content, 10% post-consumer material and is SFI Sourcing Certified. A Rich Heritage of Innovation and Quality. A world-leading provider of solutions for efficient document management, Smead is a woman-owned company well-known for its high quality, environmentally responsible products and innovative organizational systems. For more than a century, Smead has been committed to one purpose: Keeping You Organized! 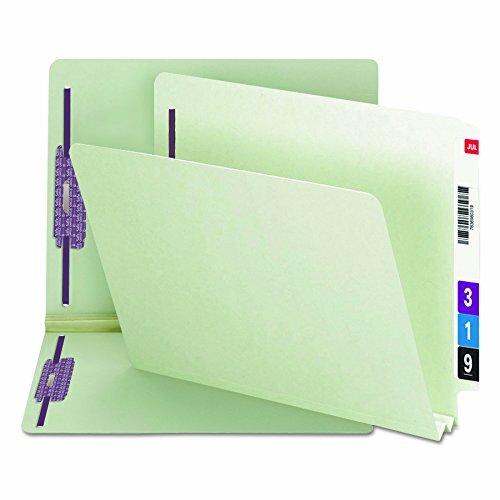 Smead End Tab File Pockets are favored by law firms and other document intensive industries. Pockets will hold standard letter size top tab folders without bulging. Accordion style sides expand 5-1/4" and hold up to 700 sheets. File pockets take up minimal space, expanding only when extra storage capacity is needed. Entire gusset is reinforced with tear resistant material for extra strength and durability. 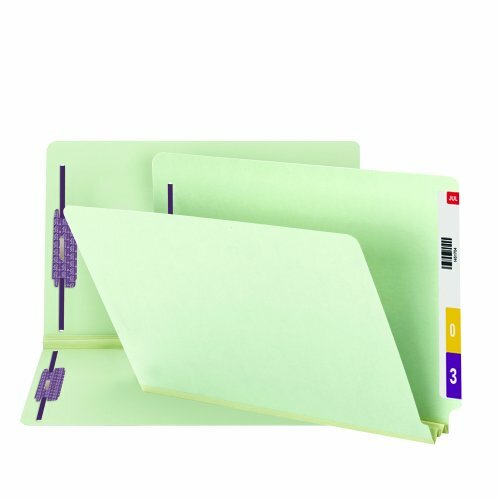 Colored gussets help organize files by case or subject. 3/4" wide straight-cut tab is reinforced for frequently handled files. Includes 10 extra wide letter size (12-3/4" W x 9-1/2" H) end tab file pockets with 5-1/4" expansion. Contains 30% recycled content, 30% post-consumer material and is SFI Sourcing Certified. A Rich Heritage of Innovation and Quality. A world-leading provider of solutions for efficient document management, Smead is a woman-owned company well-known for its high quality, environmentally responsible products and innovative organizational systems. For more than a century, Smead has been committed to one purpose: Keeping You Organized! 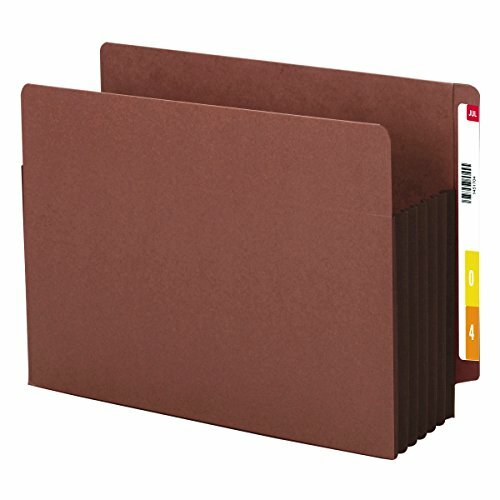 Smead End Tab File Pockets are favored by law firms and other document intensive industries. Pockets will hold standard letter size top tab folders without bulging. TUFF pockets are virtually indestructible and will withstand years of heavy use, even when pulled from the shelf by the gusset. They have fully lined gussets and include a hidden reinforcement strip at the point of greatest stress. Accordion style sides expand 3-1/2" and hold up to 400 sheets. File pockets take up minimal space, expanding only when extra storage capacity is needed. 3/4" wide straight-cut tab is reinforced for frequently handled files. Includes 10 extra wide letter size (12-3/4" W x 9-1/2" H) end tab TUFF file pockets with 3-1/2" expansion. Contains 30% recycled content, 30% post-consumer material and is SFI Sourcing Certified. A Rich Heritage of Innovation and Quality. A world-leading provider of solutions for efficient document management, Smead is a woman-owned company well-known for its high quality, environmentally responsible products and innovative organizational systems. For more than a century, Smead has been committed to one purpose: Keeping You Organized! Want more End Tab Expansion File similar ideas? Try to explore these searches: Harley Plush Toy, Compression Unions Tees, and Climate Wine Cooler.